Afternoons are really mine! Those few minutes before my school age children come home and my little ones are still napping. I have total peace and quiet. No noise even from outside since everyone in the neighborhood is siesta-ing. I make myself an espresso or if I'm feeling fancy a homemade version of those fancy-pants coffee drinks like macchiato, marocchino, café bombón or café miel that my cousin Kriszta turned me into last summer. Grab a book, work on my cookbook, read e-mails or check up on with you guys on Facebook or ... just daydream out my window. But sometimes simply a cuppa coffee isn't enough. Coffee needs a dippable friend. 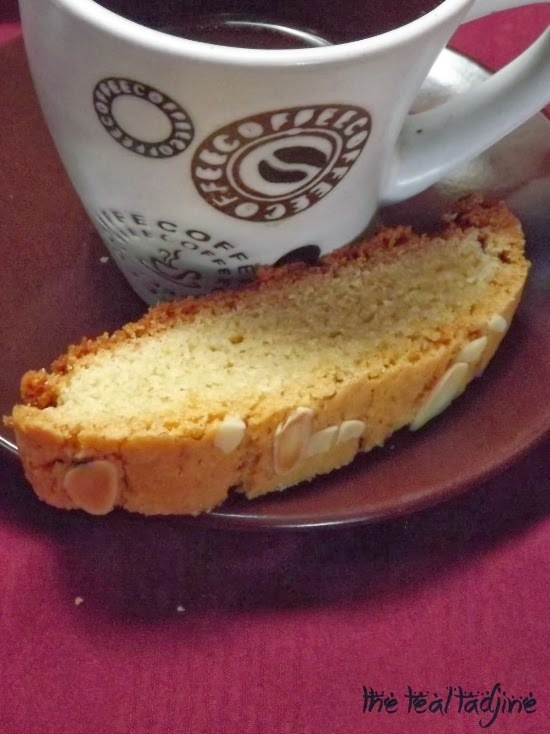 Coffee needs biscotti! Biscotti (as described on Wiki) are oblong-shaped cookie/ biscuits, made dry and crunchy through cutting the loaf of dough while still hot and fresh from baking in the oven. You'll find several different types of cookies that can or could be categorized as a biscotti from the Tuscan Canntucci, French Croquant, German Mandelbrot, Moroccan Feqqas, or to even the twice-baked breads the English Rusk or German Zwieback. All delicious homestyle, long lasting cookies that just asking to be dipped and dunked. 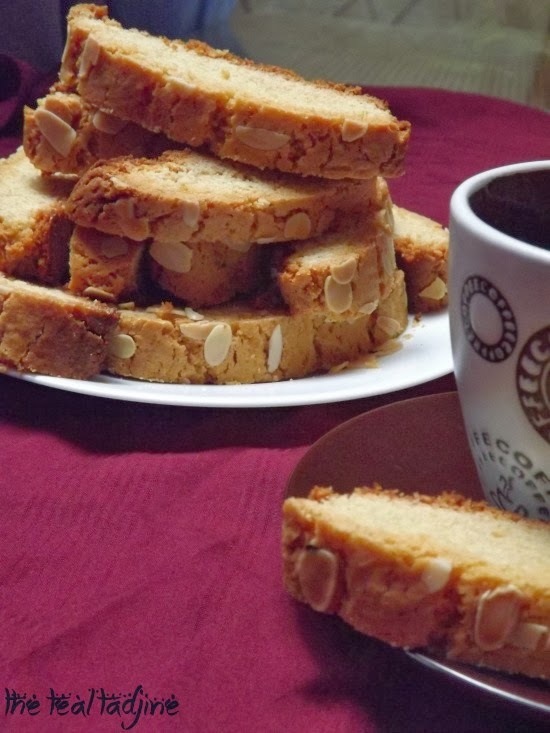 So today of course I'm going to share the Algerian "biscotti" as several of you have asked about it on Facebook after I posted a quick snap shots of it few days ago. 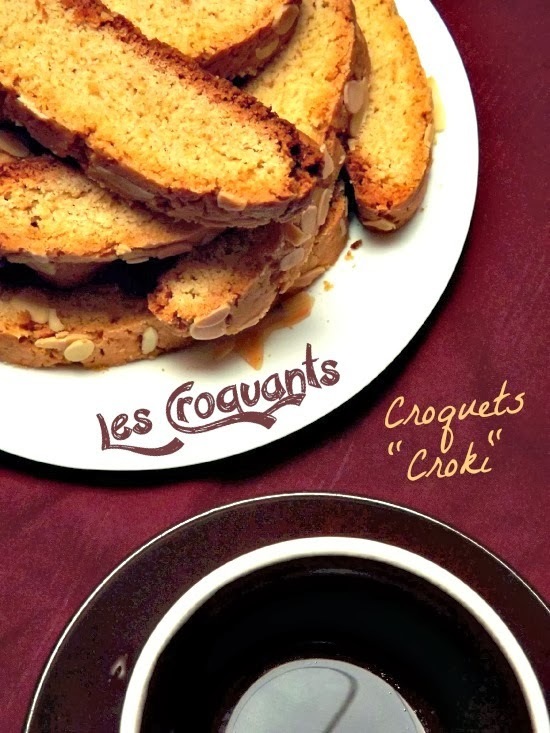 (Maybe some day I'll open an Instagram account I donnow) Anywho, the Algerian style biscotti is known as les croquants (French: crunchy), el croquets, الكـــــروكي or more amicably known just as « CROKI ». Being a person whose had a LOT of (overpriced coffee shop) biscotti in her life I love and know my biscotti! And believe me when I first had these Algerian style biscotti I was like WOW! They're NOT hard as brick! I ♥ these! 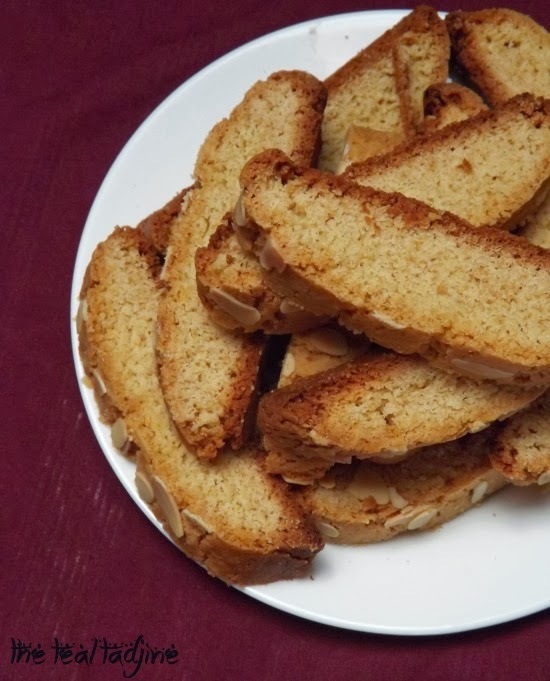 This Algerian style biscotti is little different then the more well known (original) Italian and popularized American style biscotti. The Algerian version is more tender yet firm, crumbly and not rock-hard at all. And unlike it's Italian and American counterparts making the dough is easy to put together. No endless kneading to combine a dry, crumbly mass into a ball. Also no special equipment or ingredients are needed; just a bowl, a spoon, baking sheet and a knife. And all the ingredients you probably already have in your pantry. I've done a little work on these cookies. Not that they aren't tasty from the beginning. This recipe I learned from my late mother-n-law was and is delicous. But for modern needs we can often reform traditional recipes making them healthier. I've ditched the white flour using whole grain wheat flour instead. I reduced the amount of sugar by 2/3 and used homemade brown sugar from date molasses. You get little more flavor and also nutritional bang for your buck due with the date molasses. But you could go even further making these biscotti totally refined sugar free by subbing honey. And oh yeah the best part I also used a light and fruity cold processed Algerian olive oil from Kayblia. By switching the butter out, you'll get the extra benefits of the oliver. The olive oil gives this biscotti a light taste and texture. Olive oil naturally contains Vitamin E which helps keep baked goods fresher longer. And while I love and use butter, olive oil is much superior health wise. Olive oil has no transfat, less saturated fat and naturally free of cholesterol. By using olive oil here we've reduced the fat content by 25% (yeah reason to eat more huh?) And also using it here we've upped our monounsaturated fat and polyphenolic compounds and along with Vitamin E it also contains Vitamin A, D and K. For other benefits check out what Olive Times has to say. These cookies are Tasty! Easy! Healthier! So I want you to go out and MAKE THESE COOKIES RIGHT NOW! More here on the history of biscotti. 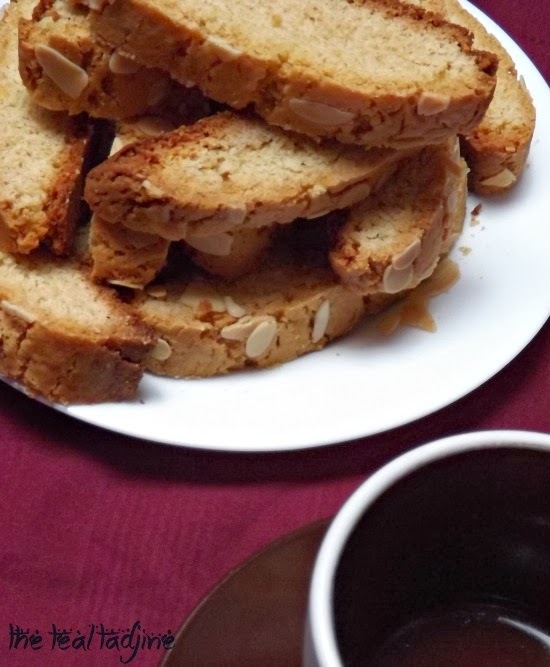 Algerian style crunchy almond biscotti that with easily withstand multiple dips into your favorite coffee ,tea or steaming cup of hot chocolate. They store well so feel free to bake a double or triple batch. PREHEAT your oven to 180°C - 350°F. SIFT the whole wheat flour 4x making it as light as possible. In a large mixing bowl, baking powder and salt. PUT the almonds on a baking sheet and toast them in the oven for about 12 minutes, or until they are well browned, fragant but not burned. Remove the almonds and allow to cool. Keep the oven on. Once cooled, put them in a food processor and pulse 5 or 6 times. If you don't have one, simply place the nuts in plastic bag and beat with something heavy like a pot or rolling pin until ground (smashed) to your liking. No worries! Once you're done add the almonds to the flour mixture. IN the other large mixing bowl, beat together the sugar, eggs, oil, orange zest and anise. Mix until well combined. In batches add the dry ingredients until the mixture forms a dough. TRANSFER the dough to a lightly floured work surface and shape into 2 logs about about 25cm - 10 inches long and 10 cm - 4 inches in width. Place on a silicon or parchment paper lined baking sheet. Brush generous with the egg wash then sprinkle with the sliced almonds. REDUCE the oven temperature to 170°C - 335°F and bake for 20-25 minutes or until golden on the bottom. Rotate your tray halfway through cooking to ensure the cookies cook/brown evenly. ONCE baked, transfer to wire rack to cool, then with a serrated (bread) knife cut the cookies into 2cm - ¾ in slices, which is about the width of your thumb. Use a back and forth sawing motion. This helps reduce crumbling. And for more elegant looking cookies cut the cookies on an angle.Don't wait too long to slice the cookies, as the longer you wait the harder the logs will be and more difficult to slice. Allow to cool before eating. Serve these delicious crunchy cookies anytime of the day: breakfast, midmorning coffee, after lunch coffee, tea time or even after dinner with your favorite hot beverage. If you'd like to make the traditional version of these cookies, simply use equal amounts of all purpose white flour, 2/3 cup - 150g melted butter instead of the olive oil and use 1 cup granulated sugar instead of the brown sugar. Cool the cookies completely before storing. To keep these cookies crunchier for long period of time, place them in a metal cookie tin at room temperature. Alternatively, place in glass jars or plastic container, but beware the cookies may soft and lose their crunchiness. Since these cookies keep well you can easily double or triple the recipes. But keep in mind you should only put 2 logs on your baking sheet at a time for them to bake properly. If for some reason you don't have or like olive oil you can easily replace it for regular colza oil (same amount). And if you want to make this cookie recipe refined sugar free replace the brown sugar for ½ cup - 190ml honey. Much like their American and Italian biscotti counterparts these Algerian biscotti cookies can be varied and jazzed by adding dates, nuts, spices, and or chocolate to the dough. Or alternatively dip them in chocolate after slicing. To make these cookies gluten-free replace the whole wheat flour with 1½ cups of your favorite gluten-free baking blend + the 1 cup ground almonds mentioned in the recipe. If possible, don't bake these cookies (or any kind of biscotti) on humid days they will spread out too much and become massive globs. If needed, place the logs in the fridge for 20 minutes before baking. what do you like to dunk in your coffee? Oh how yummy do these look? Hey! Would youu mind iff I share your blog with my myspace group? There's a lot of people that I think woul really enjoy your content. There's deefinately a lot to leartn about this issue. I reallyy like all the points you've made. I can figure things out pretty quick. I'm thinking about setting up my own but I'm not sure where to begin. Do you have any points or suggestions? I wouldn't mind composing a post or elaborating on a few of the subjects you write related to here. Goodd day! This is my first visit to your blog! We are a group of volunteers and starting a new initiative in a community in the same niche. Your blog provided us useful information to work on. You havbe done a outstanding job! this web site is truly fastidious and the people are really sharing fastidious thoughts.